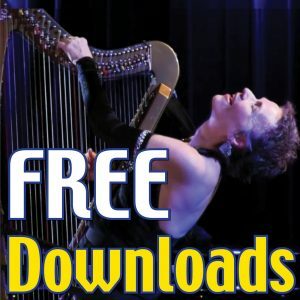 Tonight at midnight is the DEADLINE to register for “Hip Harp Toolkit” – my arranging class just for harp players — and get a $200 discount PLUS two great Bonus Classes. If you play the harp I don’t want you to miss this – because what you learn in this class will liberate your creative expression, your holiday season – and will liberate and inspire you every time you sit down to play your harp. And after midnight tonight both the bonus and the discount are gone! So what is this class all about? This class is about learning the “Arrange Yourself” method for creating spontaneous arrangements from any simple tune. The goal of the course is to create a whole set of arrangements – a ‘repertoire’ – and do it fast – by learning to apply this method to any simple tune: Holiday tunes, Celtic, Latin, meditative – even classical melodies. (And I give you dozens of these well-known melodies in the class so you can build your repertoire fast). Imagine what this Holiday season would be like if you could just sit down and play dozens of tunes that people love to hear? What does that mean? Is it ‘magic’? Learning the “Arrange Yourself” method means we focus on the practical magic of using a simple arrangement structure or formula — a kind of musical blueprint — that lets you simply sit down and CREATE spontaneous arrangements on the spot. Is it really ‘magic’? Yes and no. It is magic in that it trains you to transform any simple melody into an arrangement of any length, at your own technical skill level. It feels like magic when you can play tunes people love in a way also develops your improv skills! It seemed like magic to me before I learned how to do it. And once I learned it, it helped me in every kind of playing I do, from background gigs to improvising with bass players, singers or guitarists, and even in creating arrangements on over a dozen CDs and in my PBS Music Special. It even helped me develop my TEDx talk, and helps me every time I’m on a radio or TV show and they ask me to make a piece longer or shorter. It’s all starts with learning the basic skills of spontaneous arrangement – my “Arrange Yourself” method. In reality, these are the same practical skills that every jazz player has — but you don’t have to play jazz in order to use them – and in fact, it’s much easier when you focus on music like the Holiday, Celtic, Latin, and classical tunes that I give you in the class – and like magic – you’re playing an arrangement that’s different every time you sit down with your instrument. A lot of us learned to approach music as if we need to prove our worth with each piece we play, by always playing music that’s complex and ‘impressive’. It’s as if – if we were cooks – we need to make every meal a five-star gourmet dining experience – and if we don’t, we’re not good enough. The truth is that it’s great to have a few ‘fancy’ pieces – pieces we work hard at, that pull out all the stops and let us really show what we – and our instrument – can do. (My piece “Baroque Flamenco” is like that, and I love playing it!) But we also need to be able to nourish ourselves – our families, our listeners – with many different meals, many different pieces. So, think about it … If the only breakfast we can make is ‘Eggs Benedict” at a Five-Star level — we’re missing out on the chance to sit down with friends for many wonderful meals – simple, easy, wonderful meals that don’t require following a complicated recipe and that connect us with others! Learning how to use an arrangement formula is kind of like learning how to make healthy, creative meals from whatever you have in the fridge because you understand how to put them together as a meal. That’s what you learn to do in “Hip Harp Toolkit” using the “Arrange Yourself” method. You create a world full of music. You connect with people in your life. You ease people’s sadness. You play the harmonies when they sing. You play the soundtrack for their dreams. You comfort their pain. You resonate with their joy. You connect the world with music. And you have deep, wonderful fun – sharing yourself with your instrument.